After safely dropping off my third novel, “The River Keeper” to my editor a couple of weeks ago I’m experiencing an entirely different lifestyle than I’ve been used to as of late. Since last October I have been revising and critiquing my new work. The first draft grew from 87,000 words to 101,000. The characters have become more colorful and complete. I can now actually see the lines in their faces and smell their surroundings. So while I wait for “The River Keeper” to return what shall I do with myself? First thing was to clean off the desktop of my computer. It took me a few hours and some cold, steel willpower but when I emptied the trash I had disposed of over 1500 items. To permanently delete anything is very hard for me since I’m somewhat of a hoarder, but I did it. Wonder when I’ll realize I’ve thrown something away that I need? Now that my days are not filled with my lead character, Callie Mae McCauley’s thoughts I can do some volunteer work and cook my poor, hard working husband a decent meal. I’m reading more too, and doing research concerning possible ways to publish my children’s picture book this year. I would also love to start writing some inspirational articles to submit to Christian Magazines. And a short story project is on the horizon. I’m trying very hard to be where God wants me to be too, i.e.… helping friends and visiting with family more. I’ve found that as a writer I can very easily get lost in my own little world. I tend to want to shut out anything that will take me away from my work. I don’t want to answer the phone and I have to fight the urge to hide in the closet with my laptop when someone knocks on the door. A writer is often looked upon as a sorry, good for nothing person who sits at home all day and watches soap operas and sleeps till noon. If only the world knew the clutter in a writer’s brain. It’s almost impossible to stop thinking. Sometimes at night I find myself counting to take my mind off the days events and shut off the voices in my head. I think counting is normal since people have been counting sheep to induce sleep for hundreds of years, don’t you? Normal. That is a loaded word if I’ve ever written one. What in the world is normal? For me it’s letting my imagination soar. To create stories and settings and give characters names, and scars of their faces, and long straight hair. It’s putting down on paper the sights and sounds of places I want my readers to go. My normal is not your normal and your normal is not mine. Thank goodness God created us all with different personalities, looks and abilities. Wouldn’t the world be blasé if we were all really normal? Webster’s Dictionary says normal is conforming to type or natural law. 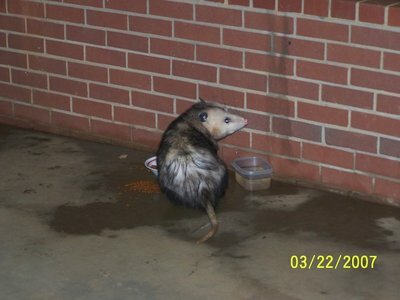 Well I suppose I’m like a possum eating cat food, like the possum, I tend to conform to my own way. I look at things a bit different than most. When I see the sunlight filtering in the window and watch the dust particles float through the air I don’t have the urge to clean. I have the desire to describe how the warmth of the light feels when it touches my skin and how the magical dust is dancing on the wings of fairies. As a writer I may never achieve the glory of hitting the New York Times best sellers list, but that won’t stop me from reaching for it. And in the meantime I’ll continue to write down my stories, count sheep and never, ever, become normal. Love this, Sarah. I was just taking a break from my own writing (and watching dust particles) by reading through some of my favorite blogs. Well said. Previous post: Silk Purse, or Sow’s Ear? Next post: Who Lieth Beneath the Sod?